It is for the first time that the two IT giants will announce their quarterly results on the same day. Brokerage firm Prabhudas Lilladher expects revenue of TCS and Infosys to grow 2.3 per cent in constant currency terms in Q4. Shares of IT giants Tata Consultancy Services (TCS) and Infosys were trading flat on the BSE in the early hours, with their January-March quarter (Q4FY19) results set to be announced later in the day. At 9:40 AM, Infosys was up 0.82 per cent at Rs 749.25 while Tata Consultancy Services had gained 0.69 per cent to trade at Rs 2,033. In comparison, the S&P BSE Sensex had risen 0.23 per cent, or 87 points, to 38,694. At the bourses, TCS and Infosys have outperformed the benchmark S&P BSE Sensex in the last year as they have gained over 39 per cent and 35 per cent, respectively. The S&P BSE Sensex, on the other hand, has risen nearly 14 per cent during the period while the S&P BSE IT index has surged over 28 per cent, ACE Equity data show. Brokerage firm Prabhudas Lilladher expects revenue of TCS and Infosys to grow 2.3 per cent in constant currency terms in Q4. It also sees the former's operating margin remaining stable and that of Infosys facing some headwinds. 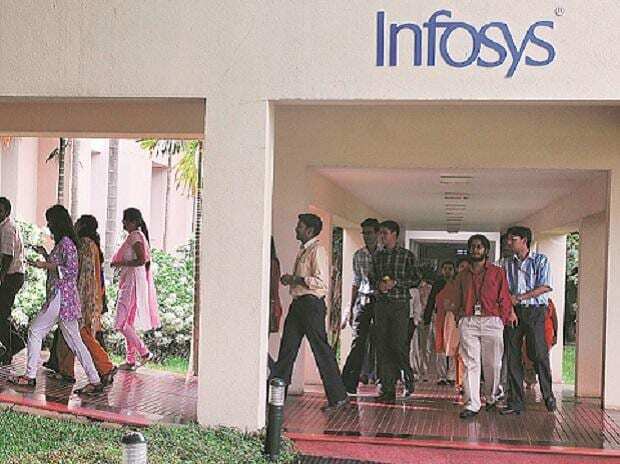 Edelweiss Research has said accelerating digital growth, an improving deal pipeline and revival in the BFSI (banking, financial services and insurance) and retail verticals would accelerate Infosys’ revenue growth in the next financial year. “We estimate 8 per cent growth in dollar revenues in FY19, which will rise to 10 per cent in FY20,” analysts at the brokerage wrote in an earnings preview note.